Robotic Infinity Machine is a visually stunning and very unique robotic sculpture. 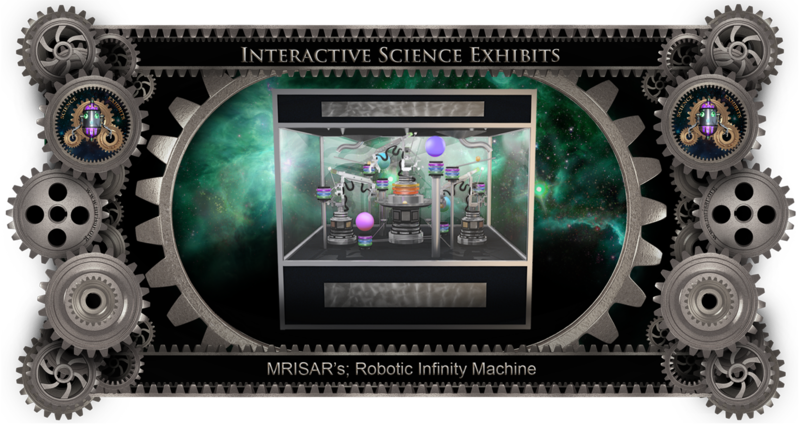 This exhibit combines educational elements that relate to STEM, robotics, electrical science, electromechanical science, electronics, aero-dynamics, gravity and the principles of lift. It uses the Bernoulli Blower effect and the Rube Goldberg effect to draw the user into an educational and artistic experience! Basic description of activity: A robotic electronic sculpture with floating spheres, rolling spheres, LED illuminated columns and many kinetic elements. The spheres are used as the catalyst for what transpires as they move from the top of the case to the base of the display area while going through many interesting and highly visual elements. Among other things the spheres are passed by three robot arms, rolled down a series of rails, put on a beveled disk that is part of the central column, roll through and trigger a number of electronic and mechanical effects and elements. ​This exhibit features three electromechanical robot arms that measure approximately 39” long from the tip of the fingers to the base of the shoulder pivot assembly. These robotic arms each have 3 Fingers and five ranges of motion. The fingers come in either black or white UHMW. Complete exhibit includes the pedestals, three robot arms, support electronics, control panel top with controls mounted, interconnects, exhibit case LED based lighting and exhibit case. The exhibit is 8’ x 8’ x 72”.